Is it possible to get a ‘new’ chin every two years within 5 mins? Yes, it is and I just got my ‘new’ chin from The Clifford Clinic… yeah! When I first visited The Clifford Clinic and told Dr Gerald Ee about my short chin, he advised me to do fillers to see if I liked the results, before considering any chin implant or jaw surgery. I thought this was a better idea as it was a temporary solution for about a year plus, without any risk to the body as it would be absorbed by the body without any harm. It had been close to two years since I did my chin fillers and most of it were absorbed already, so I went back to my favourite Aesthetics Clinic, The Clifford Clinic, to get my ‘new’ chin. Let’s take a look at the before photos, taken a few minutes before Dr Ee injected the fillers in the chin area for me. My chin didn’t look defined and yup, it was short and receding. Dr Ee used Restylane fillers for my chin which is safe for the body. Don’t be scared by this needle cos it was super thin and everything was done under 5 mins. So you can zip into The Clifford Clinic during lunchtime to get a ‘new’ chin and zip out to grab your lunch and no one will know but yet they will wonder why you suddenly look pretty! Dr Ee is one of the most meticulous doctors I have ever seen. Just look at how he did his ‘measurement’ to ensure that the area where he injected the fillers would make my ‘new’ chin look even and project out nicely. And yes, the needle went in. So was it painful? I would say that it felt like an ant bite. Anyways, it was done under 5 mins so everything was worth it when I saw my ‘new’ chin. After the fillers were injected, Dr Ee has to use his judgement to knead the fillers in place. I think this step is extremely important to get the nicest looking chin. Hence ladies and gentlemen, if you are thinking of getting a ‘new’ chin like me, please find an experienced doctor like Dr Ee, who can create beautiful chins ya. 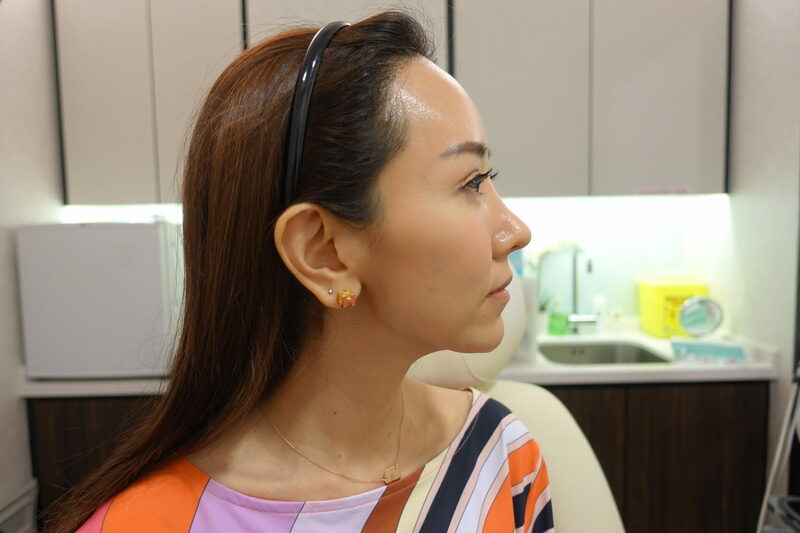 Look at how Dr Ee kneaded my new chin… he took a lot of care to give me my beautiful chin back again after two years. And yes, we were almost done. I couldn’t wait to see my ‘new’ chin! Check out my ‘new’ chin! It looked so beautiful… OMG! I am so loving it! Now my chin looked more defined with a better projection when looking at the side profiles of my face. Dr Ee has never failed me all these while hence I always go back to him whenever I need help with beauty aspects. Super love my chin and so glad that it can long me for another two years before I redo it again. Thanks Dr Gerald Ee for giving me a ‘new’ chin yet again! Don’t really know what to do without you. Everytime I visit The Clifford Clinic, it is always packed with customers so quickly call to make your appointment if you are keen to try the fillers or other aesthetics procedures. Check out their website at https://cliffordclinic.com to see the services they provide. For me, I’m just going to sit back and relax while admiring my ‘new’ chin… hahaha!